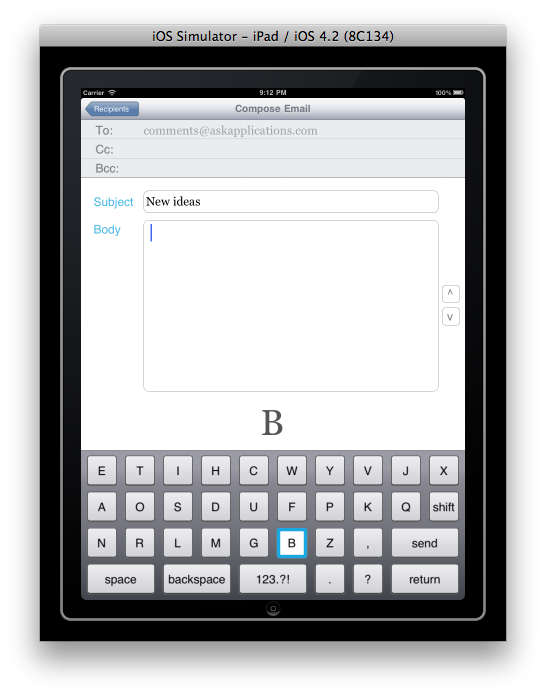 ASK Applications seeks to make mobile communication devices accessible, especially to those with physical disabilities. 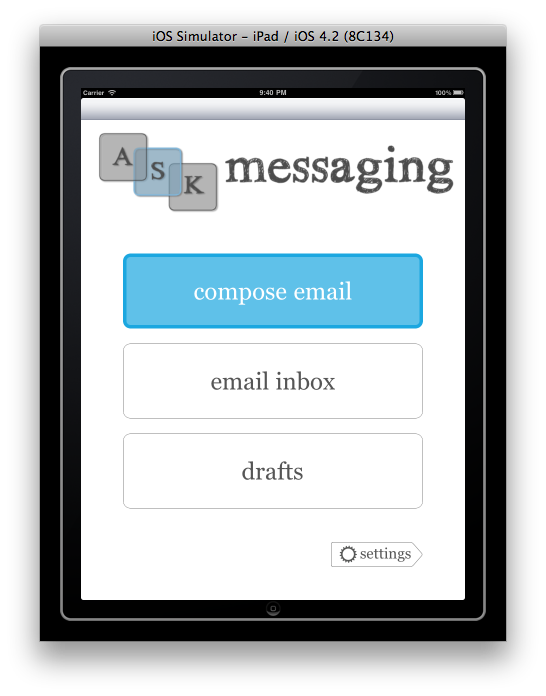 We have created an application called ASK Messaging that allows users with fine motor control disabilities to send email and text messages from an iPad, using an interface that does not require precise onscreen touches. The ASK Messaging team is honored to be named among this year's finalists. We invite you to view all the finalists of the 2011 da Vinci Awards on YouTube, and vote for your favorite by pressing "Like". This year's awards will be presented on September 22nd, 2011 at The Henry Ford in Dearborn, Michigan, with proceeds from the event benefiting the National MS Society, Michigan Chapter. Also, we hope you check out http://www.davinciawards.org/ to learn more about ways you can help support the National Multiple Sclerosis Society and their mission to move together toward a world free of multiple sclerosis. 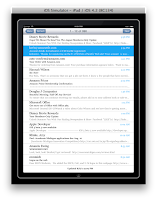 ASK Messaging Pending Review - Look for it on the App Store Soon! 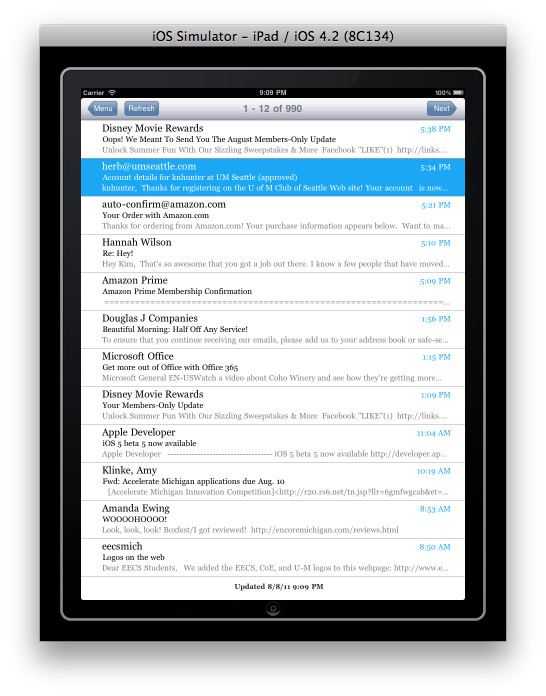 ASK Messaging is featured in the Spring 2011 issue of the Michigan Engineer! Click here to read the article. ASK Messaging application wins first place overall in the Spring 2011 U-M Mobile Apps Challenge. The Spring 2011 Mobile Apps Challenge promoted entrepreneurial thinking and encouraged the U-M community to develop innovative mobile applications. U-M students, faculty, and staff entered more than 18 apps in three platform categories: iPhone, Android, and web applications. ASK Applications is currently participating in the summer 2011 session of TechArb, the U-M Student Business Accelerator. The TechArb is managed by the Center for Entrepreneurship and the Zell Lurie Institute with advice and input from an advisory board made up of community leaders and professional investors. ASK Applications places first in the University of Michigan Center for Entrepreneurship's (CFE) Bay Area Entrepreneurial Experience Competition. Members of 25 student companies travelled from Ann Arbor to California to pitch their ideas to other entrepreneurs, venture capitalists, and consultants in the Bay Area. ASK Messaging application takes second place at the Berkeley Mobile International Collaborate (BMIC) University Mobile Challenge at the 2011 Mobile World Congress in Barcelona, Spain. The event was created and run by BMIC through the support of industry sponsors that include Sprint, Standard Chartered Bank, NAVTEQ, and Nokia. Student teams from 11 countries and 13 universities presented their innovative concepts in front of a panel of prominent judges from the mobile industry and Venture Capital firms. We'd love your feedback about ASK Applications! How can we improve our products? What features are important to you? Send us an email! 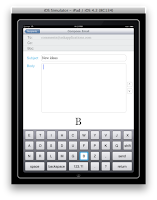 Assistive Scanning Keyboard Applications, LLC. Powered by Blogger.